Our decision to detour through the Teton and Yellowstone National Parks on our return trip from visiting family out west was made on rather short notice. While I'll include more detail on the trip in the coming weeks, I wanted to share a link to a rather helpful resource I picked up along the way. 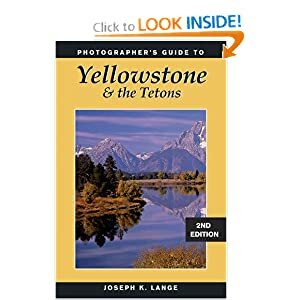 The "Photographer's Guide to Yellowstone & the Tetons" by Joseph K. Lange proved to be a helpful resource. Unfortunately our visits to this incredible location have always been as way points either to or from other destinations and time has been short to say the least. Knowing we wouldn't have time to investigate on our own, I picked up this book in hopes of quickly hitting the "high points". Even so, we STILL ran out of time. Whether you're just passing through or making the parks your primary destination, this book is a helpful resource to have in your library.